This is a really fantastic salad which is both tasty and healthy. I modified it slightly from a post from my fellow blogger at the Taste Tickler and I made it for guests last night and we ate almost the entire bowl. That’s always a good sign. 1 bunch Scallions, trimmed and sliced in half and chopped. Cook the soba noodles by bringing a large pot of water to a boil and cooking the noodles according to the package directions. Drain and rinse with cold water or plunge into ice water and then drain and add into large mixing bowl. In a small bowl, whisk together the dressing ingredients until smooth. 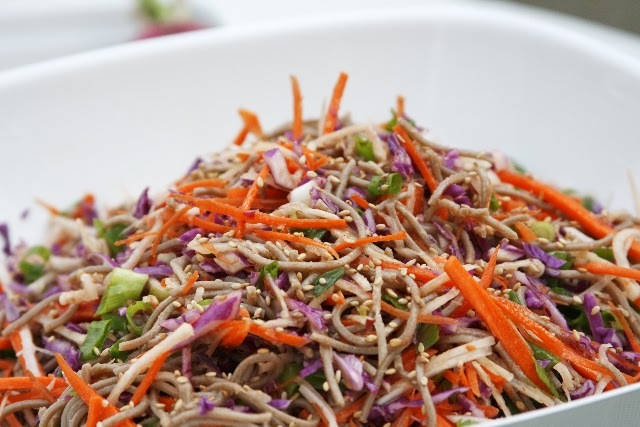 Then add the slaw ingredients into the soba noodles and toss using your hands or two wooden spoons. When ready to serve, sprinkle with cilantro and a squeeze of lime.